I touched on the topic of bone health and estrogen in this post several weeks ago. Since, I’ve had several follow up reader questions and so I thought it would be important to address this topic in further detail. 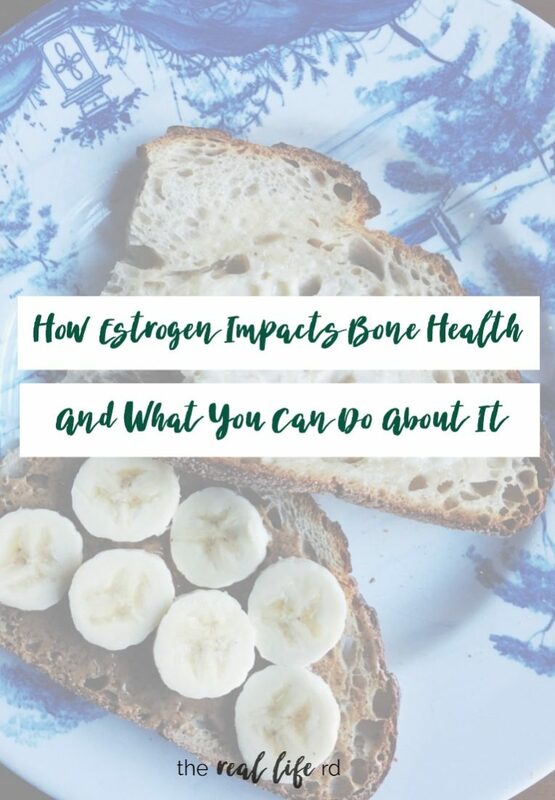 I went over a decade without getting a normal, healthy period and it never really occurred to me that low estrogen (which is a contributing factors to missing or irregular periods) can have devastating impacts on bone health. 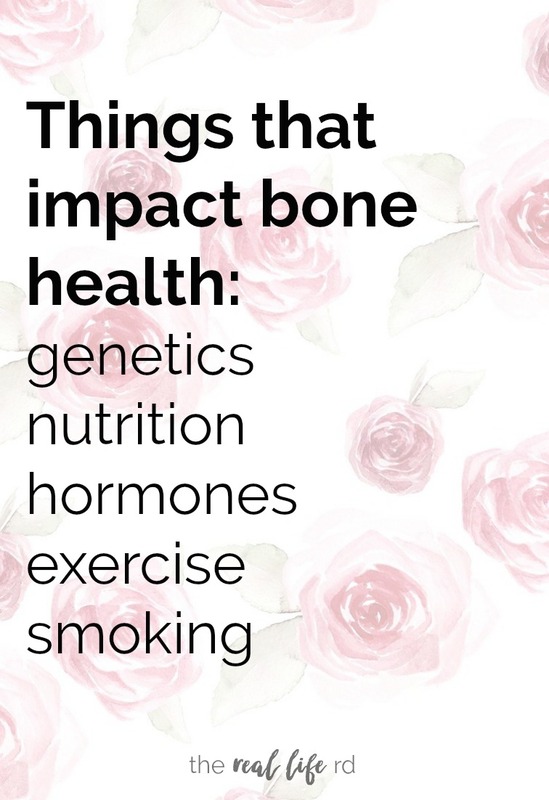 Growing up, my doctor or OB/GYN didn’t talk to me much about bone health. Very likely not intentionally and maybe there were time limitations or maybe the topic didn’t cross their mind. I’m not sure. I was continually prescribed birth control to “protect my bones” and “regulate my period” (which is ironic in and of itself because a period on birth control isn’t an actual period – it’s a withdrawal bleed) when I wasn’t menstruating on my own. Side note for clarity –> the purpose of me being prescribed birth control and many other women being prescribed birth control was not solely for contraception…it was to “fix” an underlying hormonal issue. If you are taking hormonal birth control only for contraception, that’s not the lens I’m speaking through in this post. I’ve also taken birth control solely for contraception – which is the purpose of birth control. So how does estrogen (or lack thereof) affect your bone health? Think about your bones like house renovations. Your bones are always being broken down to provide calcium to your body. Estrogen is a hormone that helps slow the breakdown of your bones and and encourage bone formation instead. You have two types of cells that are involved with your bones. When you have sufficient levels of estrogen, that estrogen helps kill off the breakdown cells (the osteoclasts) so you have less cells breaking down bone in your body. That estrogen also helps protect the cells that build your bone (osteoblasts) so they don’t die off. Think about it as less demolition guys tearing down the house and more construction guys building onto the house. What you end up with is bones that stay denser for a longer period of time. This is a good thing! 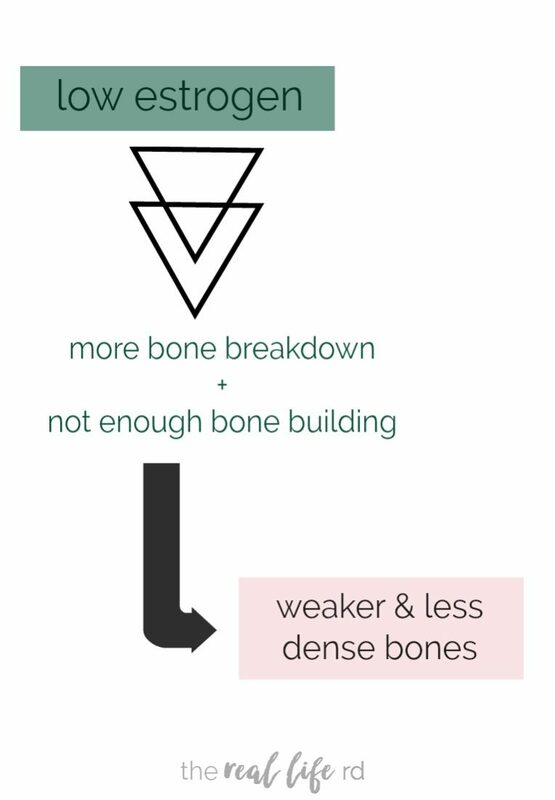 When your body doesn’t have enough estrogen you end up with more bone breakdown and not enough bone building which results in weaker, less dense bones. What we call your bone mineral density decreases. If you’ve ever had a DEXA scan from your doctor, PA or nurse practitioner, that is an x-ray that measures your bone mineral density and can tell your health care provider if you have healthy bones, osteopenia (meaning decreased bone density) or osteoporosis, which is a disease that thins and weakens the bones. If you don’t develop any new risk factors, your health care provider usually orders a DEXA scan every 2 years. How long after a missing period does it take for your bone health to be affected? There are many factors that go into the effect a missing or irregular period will have on your bone health. The timing and onset of your missing periods plays an important role in determining the impact on your bone density. 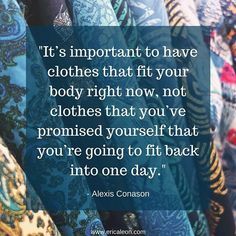 If you developed disordered eating, an eating disorder, you exercised a lot or any other reason caused your first period to be late (age 16 or older) or never come at all…..that can have a greater impact on your both health than perhaps if your period went missing for the first time in your late teens or twenties. I got my period late because I ran cross country in high school and then had irregular periods all throughout my teens and into my twenties due to excessive exercise and under eating and then it went missing for good. 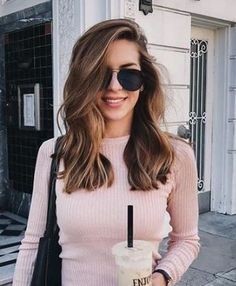 As females, we develop the majority of our peak bone mass by age 18 and by our early to mid twenties our bones have reached their maximum strength and density. Genetics play a huge role in our bone health. Unfortunately, the women in my family are prone to osteoporosis – so there are things both me and you simply cannot control. And nutrition, how we exercise & move our bodies and other lifestyle factors like smoking also impact our bone health. Also, being at a low body weight in addition to not having your period compounds the issue. So there are a lot of factors at play here which make it hard to define a specific time at which your bones are affected by a lack of estrogen. What we do know though is that early intervention is key. Even if you haven’t had a regular, healthy period for decades…it’s ALWAYS better to be late than never in order to preserve the bone density you do have! 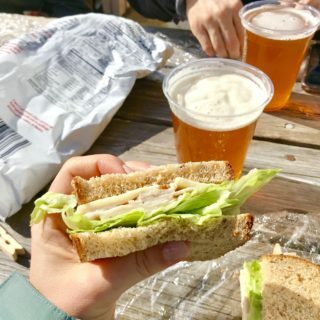 What we do know is that the loss of bone mineral density can be quick (within months) coupled with low body weight and inadequate nutritional intake. Missing your period during adolescence when the majority of our peak bone mass occurs can contribute to more significant loss. We also know that postmenopausal women lose most of their bone mass and density within the first four to six years after menopause and on average, a healthy post menopausal women loses about 1-2% of bone mass per year. When you don’t have enough estrogen in your body, you’re essentially in a post menopausal, low estrogen state so it’s not unreasonable to think about this data when thinking about our bone health when we aren’t menopausal, but we aren’t getting a normal healthy period. Okay, I know some of this information might have been overwhelming but take a deep breath. I didn’t have a period for a long time and I have a family history of osteoporosis so this is not to scare you or instill fear or more stress. Rather, let’s use this information to empower us to make decisions today that can better our health. The past is the past, the only thing we can do is move forward and care for our bodies the best we know how today. Can bone loss be reversed and what can you do to better your bone health? 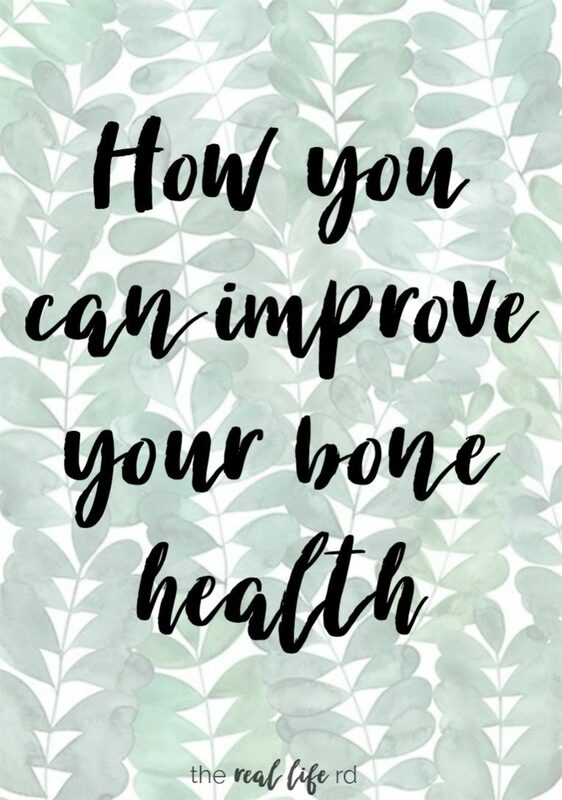 Although you won’t be able to reverse the bone loss completely, you can replace significant amounts of lost bone and I think that’s encouraging news! What happens more often than not, is women are prescribed birth control to help “protect their bones” – but the research isn’t very conclusive. Some studies showed birth control might help prevent further bone loss, and some showed some small increases in bone density over various time frames. Overall though, the evidence for birth control’s role in bone protection is pretty underwhelming. In fact, the majority of studies founds no benefit of hormonal medications on bone mineral density and actually are not recommended to protect bone health in the presence of anorexia nervosa and amenorrhea (which means not getting a period). And also know that yes, birth control can slow the rate of bone breakdown (which is good) but it also slows the rate of bone formation which isn’t helpful. 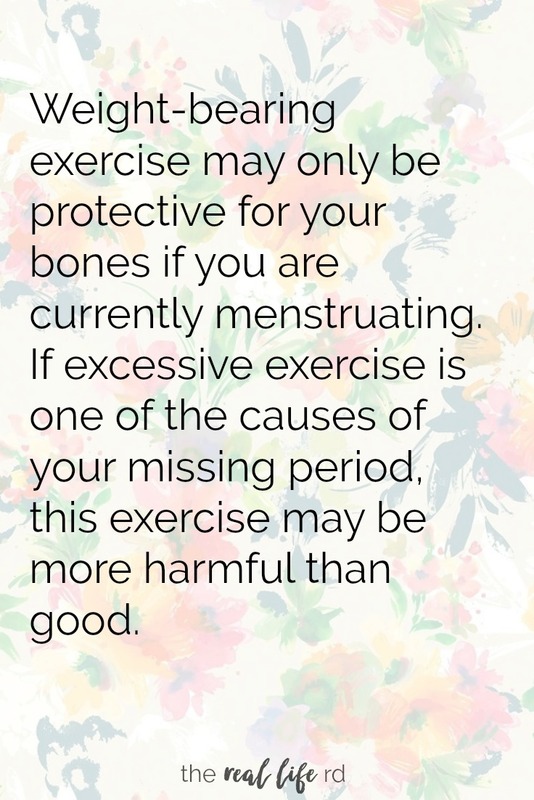 Also, it’s really important to know that weight-bearing exercise may only be protective for your bones if you are currently menstruating. If excessive exercise is one of the causes of your missing period, this exercise may be more harmful than good. Biphosphonates are a class of medications that are commonly used in post menopausal women to preserve bone density. I get asked about these medications often from women with decreased bone mineral density who are premenopausal. What we know is that the potential benefits and risks of biphosphonates are very different in premenopausal women who have a different kind of osteoporosis vs postmenopausal women. The osteoporosis seen in premenopausal women often has to do with an underlying cause of bone fragility or bone loss and treating that underlying cause should be the focus to improve bone health. Data is lacking on the long term effects and safety of these medications in young women and so they are not recommended as a go-to treatment. Okay, now you’re like…I get it. I hear you with what won’t help… but what WILL HELP? Weight restoration, supporting your body in finding it’s healthy set point weight and restoring your natural period all do wonders for your bone health. WONDERS. Adequate energy (aka calorie) intake is key too. It might take some extra 1:1 support from a dietitian you trust to ensure you are eating to support your body’s needs. Also keep in mind that unless you have the skills and knowledge to be able to meet your body’s energy needs, intuitive eating might not be an appropriate place to start just yet. These alone can often reverse a lot of the bone loss. You won’t have the bone density of someone who has never had low estrogen, but you can see great improvements to your both health. The body’s healing capacity is awesome. Getting adequate calcium through your diet is also important. Dairy products, fortified OJ, dark leafy greens, beans and lentils and some nuts and seeds are good sources. 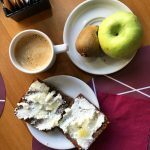 I don’t focus a lot on the nutritional minutiae of food, it’s stressful and not as important as the overarching big picture. Think of these as ones you can ADD TO what you already eat. You can also take 800-1000 IUs of Vitamin D3 per day as well – BUT go talk to your doctor first so he/she can guide you in supplementation based on your own individual needs. I hope this was informative and empowering for you. I personally have walked this path with not getting a period on my own for over a decade and have then also struggled with irregular periods and had to navigate learning to care for my body so I can have regular, natural periods. Know that you are not alone. Know that your body is not broken and that there is nothing wrong with you. I know these conversations can be scary and maybe cause anxiety and worry. We are going to face challenges in life and maybe do things we wish we didn’t..but all these experiences are learning opportunities and shape us into who we are today. Be gentle and compassionate with yourself – you’re doing the best you can and all you can do today is take steps forward to better care for yourself. 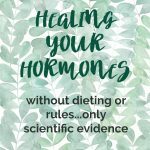 If this post resonated with you or you found it helpful, I talk more about these types of things in my online course on healing hormones and getting a healthy period. You can also sign up for my free mini email course on healing hormones where I share more tips and tools to help you best care for yourself. I’m in this journey with you! Thanks for this post, Robyn! I’m curious about something. I had been having regular periods, but was told I had low estrogen when I was having issues getting pregnant. I finally wasn’t able to conceive on my own, but was prescribed a high dose estrogen insert 2x per day for my first trimester. How can my period happen if my estrogen was so low? Also, this was 6 years ago. I am currently not getting a regular period (totally missing now). I have an appointment later this month to ask about a DEXA scan and hormone testing. It’s possible to have regular periods and low estrogen yes. But like you experienced low hormones can affect fertility. If you don’t have enough estrogen that affects your ability to ovulate – but you might still get a period. Figuring out the root cause of why your estrogen is low is the key! Thank you so much for the reply and insight. Do you have a test that you would recommend to find the root cause? I am seeing my doctor later this month and would like to bring that up with her. Hi Robyn! This is great. You are awesome. If you don’t mind me asking, I have a question around birth control. I was put on birth control to prevent pregnancy and was under the impression that it stops my own estrogen production… therefore, if it’s masking my own production would the negatively impact my bone mass? I thought birth control stops your own production of these hormones since you are injecting it through the pill, so I thought that would replace the estrogen you need for bone mass. This is my exact question! I had low estrogen in my teens but got pregnant extremely easily in my twenties and thirties. But now I wonder if it’s worth going off the pill just to make sure all is well. But definitely don’t want to get pregnant either! Hope my answer to Carolyn helps Stephanie! Hi Carolyn! The pill stops ovulation and shuts down your natural estradiol production. You are masking your own production which could **potentially** impact bone health – there’s not enough research to draw conclusions. The pill replaces your body’s estrogen with a synthetic estrogen (ethinylestradiol) – this is similar to estradiol, but not completely identical. 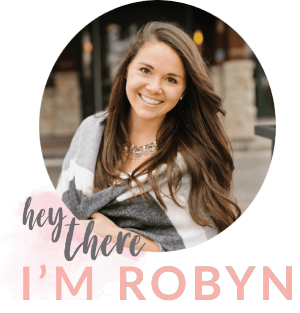 Thanks for another great post Robyn! I especially found the part about exercise fascinating, that weight-bearing activity doesn’t have the same benefit if this is causing the issue in the first place. A very important thing to keep in mind! 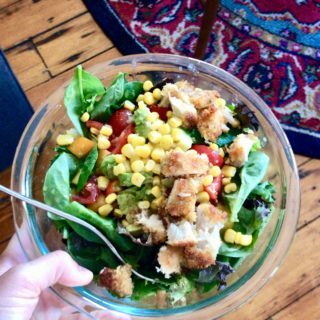 I think you may have gotten the greens/dairy thing backwards. I believe the calcium in leafy greens is less bio-available than dairy because of the oxalate content (I swear I’m not trying to nitpick, just felt as though that was an important point for readers). Hi Leanne! So glad you found it helpful! I’m glad you brought this up! Can you send over any info you have on this – from the research I’ve read and what I’ve learned in my training, the calcium in dairy is less bioavailable. But totally open to this discussion so send along anything you have and I’d love to read! Thank you so so much for this post, Robyn!! I never actually really thought about the correlation between bone health and an irregular/absent period/low estrogen. 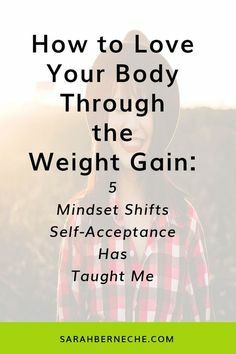 And WOW, I had no idea that weight-bearing exercises don’t help unless you are healthy in the first place….Makes sense, as I think back during my eating disorder (anorexia), I lifted weights like no tomorrow, but wasn’t actually very strong. When I later gained weight and took a break from exercise, I found that I was retaining quite a bit of muscle without even trying. So glad you found it helpful Becky!! As a young (12 year-old) girl I battled anorexia. I am now 33 and a healthy, happy mom. That said, to this day, I remember my doctor at the time threatening and scaring me about osteoporosis and ruining my ability to have children one day. It left me thinking “well if I’ve already ruined my life, why gain weight now?” (This makes me so sad for my younger self who lacked a kind recovery team!) I now understand the (misguided scare tactic) intentions of the doctor, but I applaud you for covering this topic with an empathetic IT’S NOT TOO LATE emphasis. That is huge in encouraging someone to seek healing. This was incredibly helpful Robyn thank you! I am a 27 year-old with Osteoporosis. This was due to several factors, both physical and psychological, and as a result I am in the process of restoring my bone health to the best of my ability. Your blog forces me to face the uncomfortable circumstances which I created for myself. And while that seems morbid, or perhaps pessimistic, I must reinforce how grateful I am to you for targeting what I need to be aware of in regards to my health. You have given me the platform to push myself and live my best life. Your blog speaks volumes, and while I do not know you personally, I am truly appreciative of your voice, your presence and your character. Thank you for everything you do. Reading your posts on women’s health is always super informative. I’m almost 17 now and I lost my period when I was 13. It hadn’t been too regular since it was new and it went away with no clear cause. I’ve found it hard to work with doctors since their initial reaction is birth control (which I can’t take because I have factor five leiden) and the couple of times I tried Progesterone the side effects were so miserable and it didn’t work. The doctors I’ve seen don’t seem to view it holistically. As my lack of period has continued, it’s definitely started to cause more concern so I hope to find someone who can help. Hi Robyn! I love your blog and read every single post you write! I had disordered eating in my early twenties and my period went missing for a while and then came back irregularly but I was able to get pregnant thankfully and I now have 3 daughters. My question is this, my period refuses to come back after each birth until I’ve finished nursing which has always been til my girls are about 2 years old. I’m nursing number 3 now yet, so is my missing period and low estrogen effecting my bone health? I’ve never thought of this before and quite honestly it scares me to think of what my bones might be like after nursing for 6 years! This is a really interesting question! A lot of people use this to delay a return to fertility right after they’ve given birth (to space children naturally). I know that for some women it lasts as little as 3 months, and for some women it can last much longer. I think you pose a great question! You’re so incredibly smart and its truly amazing how you can explain complex issues in an approachable way! Keep up the good work! 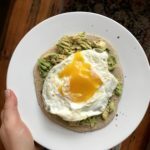 I have been a reader/follower of your blog for a couple months now and always gain so much insight on caring for my body through your blog and personal story! Thank you for always being so honest and transparent. 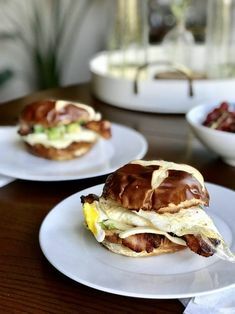 I have been diving especially deep into your hormonal health posts, and am finally coming to a place where I know I need to find some answers about my own body. So I wanted to ask a couple questions. I have had an irregular period since I started as a teenager, and I’m 25 now. There has never been a time when I could accurately predict my period (even when I was in high school, under pretty low stress, and eating regular big meals) but I also have never gone more than a month without it. I match a lot of your described symptoms for low thyroid hormone, especially fatigue, but I’m also under a lot of stress (I’m a manager which means sporadic eating patterns, a weekly healthcare volunteer, and I’m also in school (studying to be a dietitian actually!)). But my thyroid tests have always come back normal. My father has had issues with his thyroid for years, but I don’t know if there’s a genetic component to any of this. All of that to say, I’m finally understanding that none of this is normal (thanks to your help!) and I’m wondering what I should ask my primary physician for in terms of a full thyroid panel, female hormones panel, etc. to finally get some real answers. Sorry for the long post! I appreciate any advice you’re willing to give! Hi Brittney! Thanks for reading and I’m so glad you’ve found it helpful! Since I know only a very small snippet of your personal history this would be something to talk further with your doctor about. Thyroid issues have a genetic component and the “ranges” notes on labs might not be your optimal range – plus those ranges are often outdated based on current research. At the very least a TSH, free T4/T3 and thyroid antibodies are helpful in addition to estradiol LH and FSH. Hope that helps! Thank you, Robyn! That’s exactly what I was wondering. Thank you so much for being willing to help! I love all of these posts! Most of it goes over my head (not science-minded at all! ), but it helps me understand my body so much more! I got my period once at 11, and then not again for 9 years due to anorexia. Thankfully, I have regained my period and it is fairly consistent (stress impacts it A LOT). I do have a family history of osteoporosis, but I hope that the healthy place I am now has helped my bone health! What an interesting and informative post! I remember when I lost my period (for about a year and a half), I went through a period of being like “huh…GREAT!) then to slight concern about how normal it is…then to fear when I realized what this could mean for my fertility…by that point, i was ready to make changes. I hadn’t even known about all the bone loss things until recently. I mean, my god, I was doing crazy workouts and had no period; no wonder I was always getting injured. So glad others can read your words and help themselves before it’s too late. Blogger is totally free for a web site on a subdomain. I have, in the couple of months, been reading your blog consistently and have found so many of your articles helpful. Thank you so much for all the great work you do! I am in my late teens and lost my period for 9 months due to rapid weight loss because of dieting and restriction. I am currently eating to weight restore and am experiencing extreme hunger. I understand that extreme cardio or weight training exercise often does more harm than good when one looses their period because of the reasons mentioned in you blog post above. Would you say that doing 10-15 min of bodyweight exercise (i.e. planks, squats, sit-ups, push-ups) every couple of days is safe for me and my bones? I have stopped all formal exercise but noticed that I experienced a lot of loss of muscle due to my weight loss and found that I experience pain in my legs due to low muscle mass. Would, if I do low intensity exercise, I be able to safely build some muscle while not worsening bone damage? Also, I know that you are not my doctor and can therefore not exactly tell me what I should do, but generally speaking, what would you recommend/ what does the research indicate? Finally, thank you again for all you hard work. Hi SSR – thanks for reading!! I would encourage you to ask what the motivation is behind doing the bodyweight exercises. If you’re underweight and/or not menstruating, weight bearing exercise is potentially doing more harm than good for your bones. And you can’t build muscle without enough energy (and then some for building) on board. I hope that helps! I’m not your physician but I would recommend resting from all structured movement. 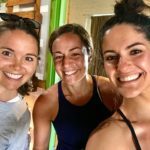 Impeccable timing of finding this blog post! Thank you! I have my yearly OBYGYN appointment tomorrow. She pushes birth control, even just low estrogen pills, on me EVERYTIME I go. Then she will pull out the “dairy calcium” only card. As an RD, I know she is just not educated. I typically accept her samples and kindly thank her for her concern. I had a normal period until 18 years of age (5’4″ 170#- very unhealthy) > college+ mom suggested ortho tri cyclene= monthly period> change to nuva ring because of “convenience”> married and no BC + no period at all (probably lost about 40# during college, but it was so gradual and not out of dieting or on purpose)> continued to have ZERO period for YEARS. Despite body weight/composition/fat %= my body didn’t menstruate. 4.5 years ago, we gave up trying naturally for a baby and conceived IVF. Post baby= no menstruation + regular doc pushing pill. I was also diagnosed with hashimotos hypothyroidism & celiac disease post baby. I always wonder if having a baby triggered it?! My general MD, who diagnosed me with celiac and hashis, a functional medicine practitioner, has me on the Linus Pauling protocol to help with bones. I now question why I even see my current OB, but then again, she takes care of my pap, breast exam, and female “health”. I’m prepared with information tomorrow when I know she will bring it up! Thanks! !